Growth in tax-credit spending by the state of Iowa has erupted over the last decade. Editor’s Note: The Iowa House of Representatives voted Monday to deny the ability of lawmakers to use visual aids in debate on the floor. To help Iowans visualize what kinds of graphics might be useful in these debates to illustrate facts, we will offer examples. Here is today’s graphic, to illustrate state trends in spending on business tax credits. As the Iowa Policy Project and Iowa Fiscal Partnership have pointed out before, Iowa’s perceived budget shortfalls are largely self-inflicted. 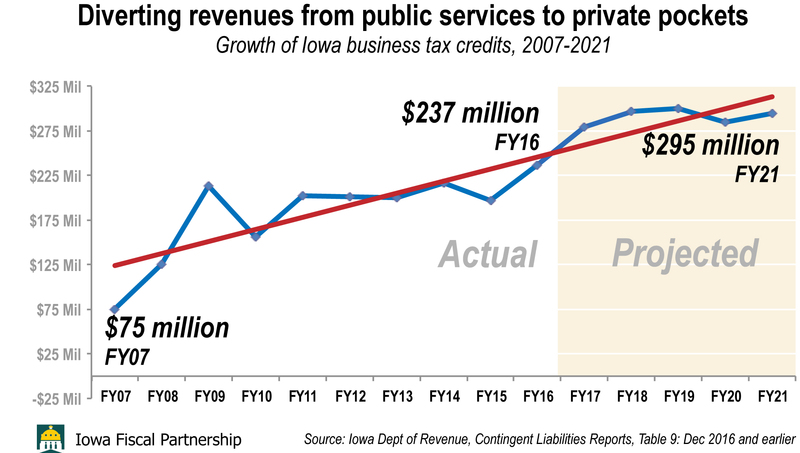 Iowa Department of Revenue reports provide a lot of data about tax credits, particularly in reports that are prepared for use by the Revenue Estimating Conference, which determines what revenue lawmakers have available to spend. These reports show the cost of those credits, which are also known as “tax expenditures,” because they effectively spend money through the tax code — revenues that otherwise would be available for fund schools and other public services. Growth in tax-credit spending has erupted in Iowa over the last decade, tripling from $75 million in FY2007 to $237 million last year. They are projected by the Department of Revenue to reach $279 million in the current fiscal year, and to nearly $300 million in just four years. For more information about Iowa spending on tax credits, see this page on the Iowa Fiscal Partnership website. The new census numbers set a baseline to evaluate the effects of Iowa’s move this year to privatize Medicaid. 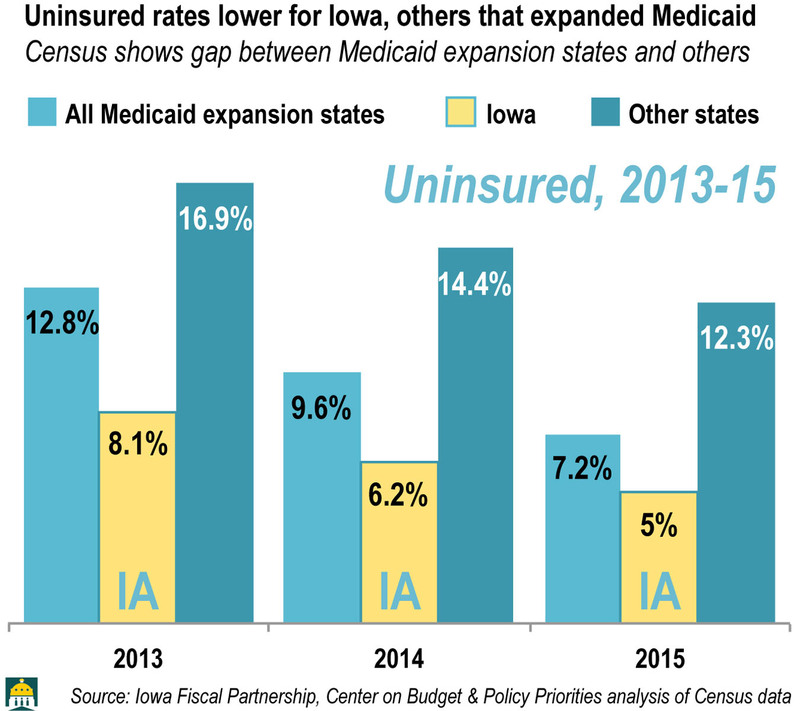 After sharp declines in Iowa’s uninsured population, it will be interesting to see if declines continue. Nineteen out of 20 Iowans are now covered by health insurance, thanks in large part to the Affordable Care Act and Iowa’s Medicaid expansion. The latest census data, released today, show that the percent of Iowans who were uninsured dropped from 8.1 percent in 2013 to just 5.0 percent in 2015. While 248,000 Iowans were without insurance in 2013, by 2015 the number had dropped to 155,000. Only four states have a lower percent of the population without health insurance: Massachusetts, Hawaii, Minnesota and Vermont, plus the District of Columbia. Across the country, the gap has widened between states that expanded Medicaid and those that did not, as shown below. Twenty-eight states, including Iowa, chose to expand Medicaid eligibility in 2014 or 2015 to families with income up to 138 percent of the poverty level. The uninsured population has declined faster in the last two years in the states that chose to expand. In Iowa, the 2015 census numbers establish a baseline for evaluating the effects of Iowa’s Medicaid privatization, which took place early this year. It will be interesting to see if the uninsured population continues to decline in 2016. If the Legislature were to curtail business tax credits even slightly, plenty of money would be available to properly fund education and other actual public priorities that are the traditional and best-focused business of state government. There are many ways to measure Iowa’s lagging commitment to public schools. One is a comparison of growth in school aid to growth in state revenues. As K-12 schools are a significant share of the state budget, it seems sensible that we would expect at least similar numbers of growth in one vs. the other. The actual ending balance for FY2015 (the budget year ending last June 1) showed a net over-the-year revenue change from FY2014 of 5.1 percent. For that same period, schools had 4 percent Supplemental State Aid — the only year that high since FY2010. For the current year, the most recent official revenue estimate is for a 3.3 percent state revenue increase, while schools are operating on budgets reflecting 1.25 percent per-pupil growth. For FY2017, the estimate is for a 4.4 percent state revenue increase, and the deal just hatched at the Statehouse — 13 months late — is for schools to see 2.25 percent per-pupil growth. 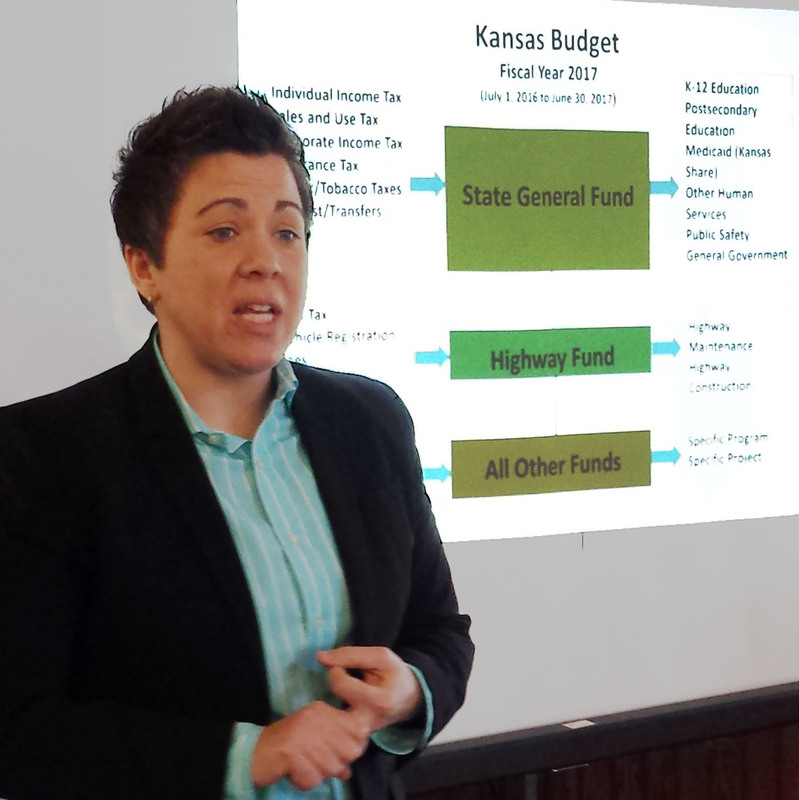 For FY2018, for budgets to be approved a year from now, the state is expecting 4.1 percent revenue growth. The school aid number for FY2018 by law was to have been set a month ago so school districts could properly plan their budgets when enrollment counts are set this fall, and to negotiate staff contracts without big uncertainties. That number has not been set and apparently will not be during this legislative session, as neither the House nor the Governor is interested. Understand, the revenue growth number is held artificially low by the growing and incessant demand for business tax breaks that undermine revenues. So the net revenue number would be much higher if legislators wanted it. Instead, they continue to give away hundreds of millions of dollars before they even reach the state treasury. Alas, that is not the political world in which we live. *The average growth for general fund revenues includes both actual results for FY11 through FY15, as well as projections by the Revenue Estimating Conference for FY16 and FY17. **Supplemental State Aid — which is a percentage for per-pupil cost growth that districts must use in building an enrollment-based budget — includes the recent deal approved by the Senate and House and expected to be signed by Governor Branstad. Mike Owen is a former journalist in Iowa and Pennsylvania. He covered state government for the Quad-City Times from 1980-85 and was editor and co-publisher of the West Branch Times from 1993-2001. He is serving his third term on the West Branch Board of Education, and is a member of the Professional Advisory Board of the University of Iowa School of Journalism and Mass Communications. Businesses need an educated workforce, and drastic cuts to education are likely to make it difficult to attract new workers, who care about their children’s schools at least as much as they care about taxes. As state legislators consider drastic cuts in Iowa’s income tax, they would do well to consider the experience of our neighbor Kansas, which enacted a huge income tax cut in 2012, and cut taxes again in 2013. These cuts have dramatically reduced state funding for schools, health care, and other services. It is instructive to consider as well the experience in Wisconsin, where a large personal income tax cut took effect at the start of 2013, with similar results: subsequent job growth of 3.4 percent, farther below the norm than Kansas’ 3.5 percent from the implementation of its tax cuts. None of this should come as a surprise. Most major academic research studies have concluded that individual income tax cuts do not boost state economic growth; in fact, states that cut income taxes the most in the 1990s or in the early 2000s had slower growth in jobs and income than other states. See Fisher’s Iowa Fiscal Partnership Policy Snapshot on this issue.